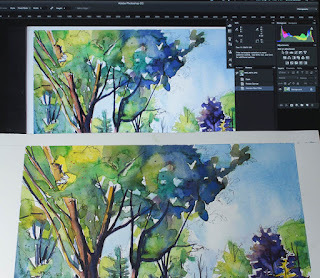 If possible, it's best to make adjustments to the photograph while comparing what you see on the computer display to the actual painting. I set small paintings up on a table top easel in front of my computer. There may be situations where this isn't possible such as if you sold the painting, or if it's an outdoor mural. In these cases you would have to make color adjustments based upon your memory which is generally unreliable. Most computer monitors have a color temperature of around 6500K, which is biased towards blue and similar to daylight. If the lighting in the room has a different color temperature than the computer monitor you will have difficulty determining if the photograph accurately represents the colors in the painting. For example, if the room has incandescent lighting then that's going to clash with the color temperature of the computer monitor. Incandescent lighting has a color temperature of approximately 3200K which is warmer than the computer display. One light source will have a cool color cast and the other light source will have a warm color cast. This is the same problem as photographing a painting using mixed light sources. The solution is to use a "Daylight" light bulb or take advantage of the afternoon sunlight from a nearby window. I use the light bulbs because they provide consistent light. I demonstrated this principle in the photographs below. In the first photograph I have a painting on a table top easel in front of my computer. The computer display has a color temperature of 6500K. The light is a regular incandescent light bulb. I used the "Daylight" white balance setting on my camera to take a picture of the painting in front of the computer. Notice how it's impossible to compare the colors in the painting with the image on the computer screen because of the orange color cast the incandescent light creates. The colors won't look that orange to the eye but there will enough of difference to make it difficult to colors on the computer screen with the original painting. lamp and the monitor make it difficult to judge colors. In the next photograph I switched the light bulb to a CFL (compact fluorescent lamp) that has a color temperature of around 5500K which is much closer to the color temperature of the computer display. A daylight balanced LED light would work too. Notice how the colors in the painting appear to match what is on the computer display. When the color temperature of the display is the same as the lighting that's illuminating the painting, it's a lot easier to make judgements about color. it easier to judge colors.